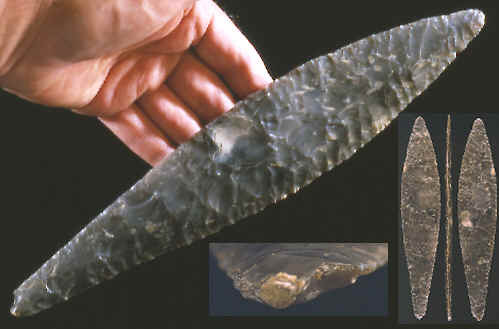 This article describes and illustrates several examples of northern Europe's late Stone Age flint daggers. 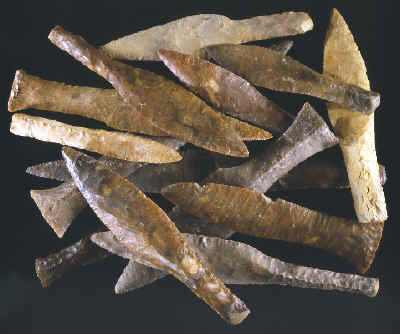 These daggers were made over a period of several hundred years beginning sometime during the Late Neolithic period and continuing well into the Early Bronze Age. The majority of them were made in Denmark and western Sweden. As many as 24 different variations of 6 main types of daggers were developed at this time. Some of them are so skillfully made and have such an elaborate style of manufacture that archaeologists have long recognized them as having been made by some of the most highly skilled flint smiths of their time. The daggers illustrated here are from the Floyd Ritter collection. "The daggers are often marvels of skill in flint-chipping. Their form so closely resembles that of metallic daggers, that some antiquaries are inclined to regard them as copies of bronze daggers and therefore as not belonging to the Stone Age".---1872, Sir John Lubbock, Pre-Historic Times. The above statement was made by Sir John Lubbock in 1872 and is remarkably accurate. For one thing, Danish daggers have been impressing people for a long time with their beautiful shapes and the skill that was obviously involved to make them. In fact, there isn't anything quite like them any where else in the world. It's also true that these people were making copies of metal daggers in stone. They began to be made near the end of the Stone Age or Late Neolithic period close to the time when some people in Europe were beginning to develop tools made out of metal at the beginning of the Bronze Age. This type I Danish dagger is very thin. Type 1's do not have thick handles which is one of the traits that distinguishes them from other later styles of daggers that were being made during the Dagger period. They are similar to Morse and Ramey knives in North America. This one measures 11 inches (27.9cm) long. Danish daggers began to be made near the end of the Stone Age during the Late Neolithic period approximately 4,400 years ago. The complete cycle of this dagger manufacturing phenomenon is known as the Dagger Period. This long and narrow dagger has a slightly thicker handle than the one above and this difference may place it within the type II group of daggers. This is the longest example represented in this article. It measures 12 13/16 inches (32.6cm) long. As would be expected, the simplest forms of daggers were the earliest styles and the more complex stitched handle daggers were latter inventions. This heavily patinated dagger has a slightly thicker handle than the blade. This is one of the traits that would place it in the type II category of Danish daggers. This example measures 13 1/4 inches (33.7 cm) long. 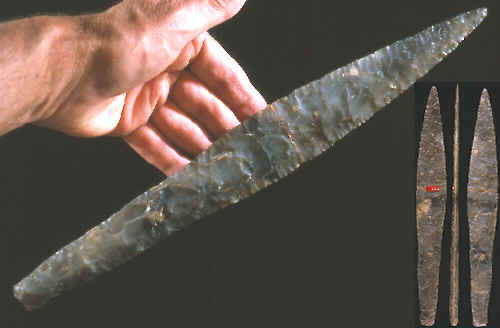 The first Danish daggers, known as type 1's, are uniformly thin bifaces very similar to Morse or Ramey knives from Late Stone Age sites in the central United States. The design of type I daggers may have been influenced by similarly shaped examples that were made by Bell-Beaker people in Great Briton.